It is human to have down times, where we feel discouraged, depressed and listless. The difference lies in how quickly we choose to get over those things that are holding us back, or making us feel less than our personal best. I believe, is the key: being able to get past the downtimes in one's life as quickly as possible and getting back on with being your best, moving forward in continuous improvement. Remember, self-improvement is a hands-on project. That is to say, that without on-going implementation of the new ideas we learn, try as we might, we aren't going to miraculously wake up one day changed people. No, we've got to act on those ideas and bits of advice we learn. Zig says, "People often say motivation doesn't last, well that may be true, but neither does bathing - that's why we recommend it every day." Understanding the need to attend to motivation and inspiration on a daily basis can lead a more positive daily life. You wake up and you pretty much have a clean slate. In most cases your day is fresh - neither overly negative nor positive. That being the case - then wouldn't it stand to reason that importing positive thoughts (i.e. reading, listening, reciting, meditating, viewing, etc.) first thing in the morning, and throughout your day could do wonders towards reprogramming the way in which you see your world? Read the above Zig Ziglar quote several times a day. Also, choose to read from an inspirational book or listen to inspirational songs at least three times a day. In addition, immediately balance any negative experiences with something positive. Given the events of most people's days this isn't always feasible, but this approach can pay dividends and is worth attempting. Keep in mind that no matter how great any idea or advice is, unless YOU choose to implement it and give it a fair shot to work in your life you're not going to get results. Let me say that again - because it's that important! YOU have to be a part of your own success journey. If you want to see real lasting change for the better in your life, you've got to be the biggest part of the process. So simply knowing that you can offset your negative feelings by introducing positive thoughts into your mind simply isn't enough. No - you've got to actually do it - it's going to mean keeping that inspirational book, or tape handy to refer to when you need to. It might mean stopping what you're doing at the moment or even scheduling yourself some time to take in positive or motivational material. Like dieting or exercising, developing a positive mental attitude is a choice. It requires nurturing. It's not always immediate, but if you will work on it, and cultivate it you will see results. And those around you will as well. 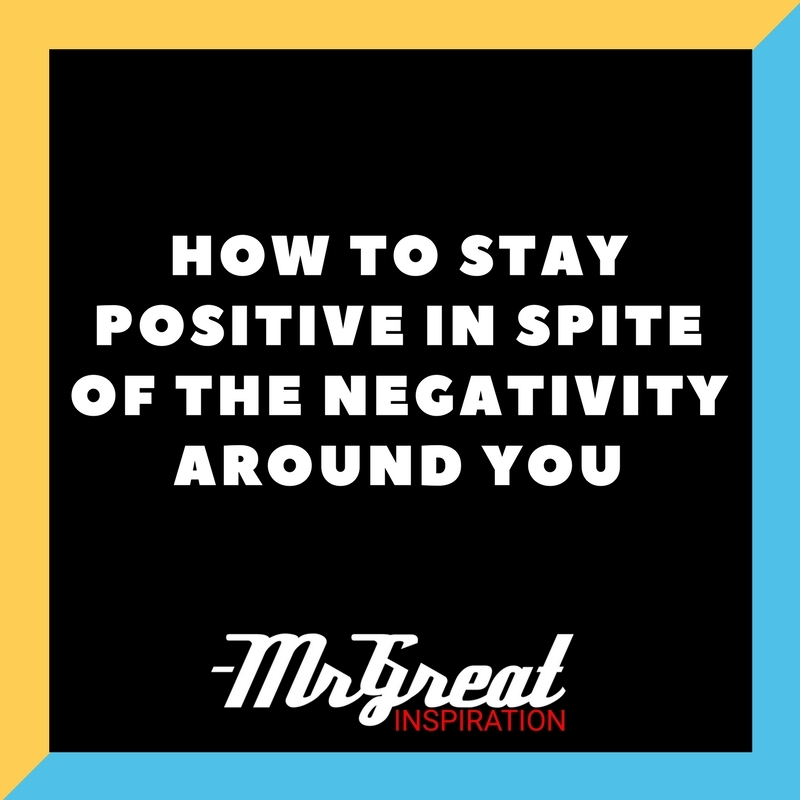 We hope guys you find our article "How to Stay Positive in Spite of The Negativity Around You" by Mr Great Inspiration useful.